Can the migrants who make it convince others not to risk it? Like many young Senegalese, Mamadou Diop dreamed of Europe. ‘We knew France from a distance,’ he recalls. ‘On TV, online and through stories told by migrants. It made you dream.’ In 2009, his dream came true, he obtained a student visa and flew to Bordeaux, France, where he studied Linguistics and Languages at Master’s level. But when he arrived, things were not as easy as in his dreams. As a student Diop worked for the university’s ‘Culture and Student Life Centre’, for which he is now Project Manager. In 2014, he published a novel about a young Senegalese girl who moves to France to finish her studies. Now, after eight years of life in Bordeaux, he is preparing his return. Diop migrated legally, but many others resort to a different option. Just this week, over 11,000 people reached the coasts of Italy by boat in just five days. Senegal is amongst the top eight countries of origin of migrants arriving to Italy irregularly via the Mediterranean route, and numbers are on the rise. Data from the International Organization for Migration (IOM) shows that over 10,000 Senegalese migrants reached Italy by boat last year – compared to 6,000 in 2015. In June 2016, the EU launched a ‘Partnership Framework’ of co-operation with countries of origin and transit to better manage migration. Senegal is one of five countries prioritized by the Framework, together with Mali, Niger, Nigeria and Ethiopia, and the EU has been focusing on tackling the root causes of irregular migration. The diaspora can serve to meet this objective. Although there are no official figures, the Senegalese authorities estimate that almost three million people, are currently living outside the country – 20 per cent of Senegal’s total population. The remittances they send back are an important part of Senegal’s economy. According to the World Bank, the country received US$1.6 through remittance flows in 2015, accounting for 13.9 per cent of its GDP. Yet the majority of remittances are used to cover household expenses, rather than being used to create jobs and help the country’s growth. To tackle the problem, the Senegalese government has sought to channel these cash flows. 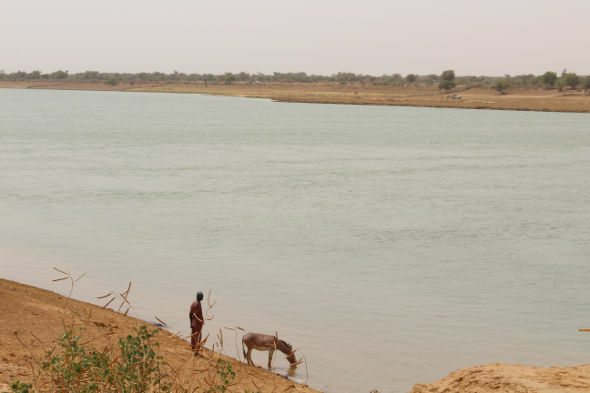 In 2008, the authorities set up a state fund designed to encourage Senegalese emigrants to invest in local economic projects, the Fond d’Appui à l’Investissement des Sénégalais (FAISE). FAISE offers loans worth between 5 and 15 million CFA (between $8,540 and $25,600) to Senegalese living abroad who wish to invest in projects that meet FAISE’s requirements: creating local employment and having a positive socio-economic impact. FAISE prioritizes projects that intervene in the fields of agriculture and agribusiness, aquaculture, ICTs, tourism, culture, textiles and confection. Transport, real estate and trade are excluded as the government does not consider these activities economically productive. The projects must also fulfil a series of criteria, which include having a positive socio-economic impact and the creation of local employment. Successful applicants would have proved they have a valid foreign residence permit and must pay back the loan at a 6 per cent interest rate. 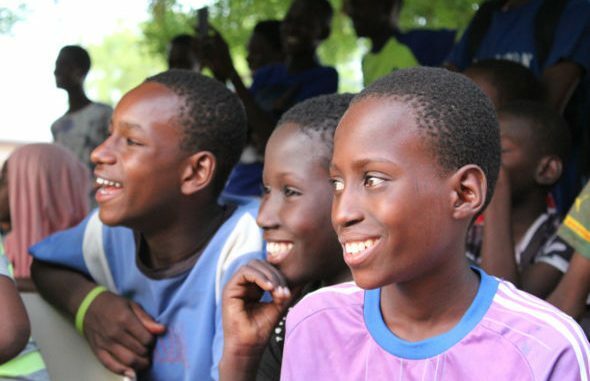 So far, FAISE has helped fund 508 projects, and lent roughly CFA 2 billion 885 million (over $5 million). Despite being a stable democracy with economic growth at over six per cent in 2016, Senegal’s average monthly salary is less than US$100, and around one in 10 people are out of work. Lack of economic opportunity is a key driver of migration. But in setting up economic projects, the diaspora is creating jobs. Thierno Boye* returned to Senegal in 2012 to set up a security agency. After 13 years in Belgium, he decided to take his skills back to the country. ‘I called my father one day and told him I was training to be a security agent. He said: good idea, there will be growing demand for that over the next few years. So I came back with this project in mind,’ he says. Boye’s agents mainly operate within a commercial centre in downtown Dakar. He has the financial capacity to employ 50 per year, but says his salaries remain low – at around US$100 dollars per month for interns and US$135 for fixed staff. This still seems enough to keep Babacar Birane* at home. He has been working for Boye for over a year. Ndary Sylla shares similar thoughts. During his 14 years in Italy, he mostly worked in the road sign industry, but is unable to use his skills at home. Instead, Sylla returned in 2015 and launched ‘Monica Gelati’, his own chain of ice-cream shops. He started in the seaside resort of Saly and opened a second branch in Dakar this month. The business is doing well, but only employs six people. 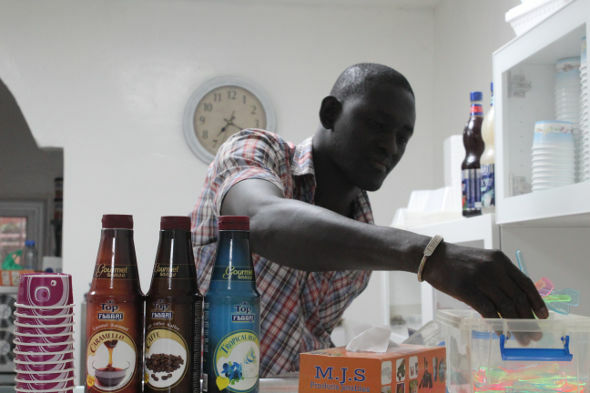 Ndary Sylla serves customers in his ice-cream shop in Dakar, Senegal, on 14 June 2017. He lived fourteen years in Italy and returned to Senegal in 2015 to launch 'Monica Gelati', his own branch of ice-cream shops. And according to Sylla, success stories like his own could encourage young people to follow suit. His employee Ndeye Fatou Niang says she has been inspired by Sylla’s experience. ‘If work goes well I would like to travel, study, learn things and then come back to invest in Senegal. This is what Sylla did. This is what we all do,’ she says. It is evident the diaspora alone will not solve the issue of irregular migration in Senegal. The impact of their projects remains small, and employment alone is rarely enough to stop young people leaving. Yet the input of the Senegalese abroad remains key, and is increasingly recognised by the international community. The IOM has been supporting development projects set up by the diaspora for over two years, and the EU recently started financing initiatives designed to harness the diaspora’s investment. Diop is convinced the diaspora is essential, particularly when it comes to raising awareness and changing mentalities. ‘Migration can form a person but it is also loaded with traps, and these must be avoided,’ he says. ‘You need to be extremely well prepared. So yes, in this sense we can show aspiring young migrants it is not an easy choice of life.